UPDATED: Wed., Feb. 6, 2019, 9:42 p.m.
Senate Bill 5001 passed the Senate on a 36-11 vote Wednesday. Among Spokane-area senators voting yes were Democrat Andy Billig and Republican Mark Schoesler; voting no were Republicans Jeff Holy, Mike Padden and Shelly Short. OLYMPIA – Washington residents could become the first people in the nation who could decide to become “human compost” after they die. A bill allowing two new technologies for the disposal of human remains, natural organic reduction and alkaline hydrolysis, were easily passed Wednesday by the Senate. An alternative is human composting, the controlled, accelerated reduction of human remains into organic matter for use in soil. It involves covering a body with organic materials, like straw and wood chips, allowing it to break down over a few weeks. The result is a cubic yard of soil indistinguishable from other compost. The remnants could be taken home by family members, with the rest being scattered on conservation land around the Puget Sound. Recompose, a new Seattle-based business that plans to offer the service, conducted a pilot program last year with five donor bodies at Washington State University. 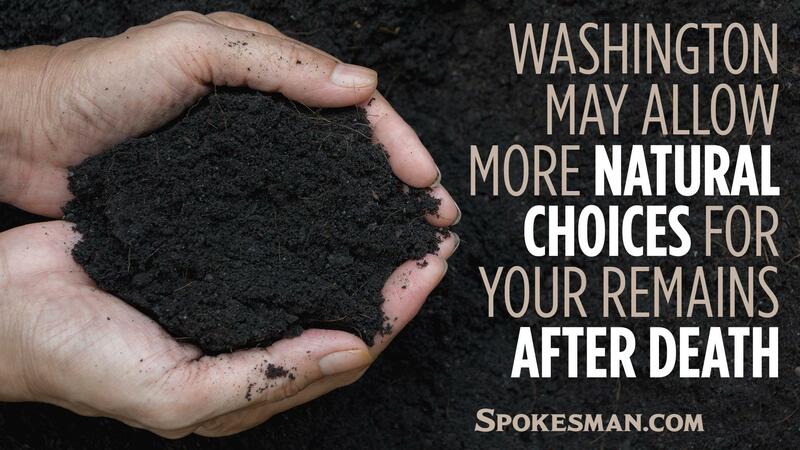 Washington would be the first state in the country to allow the composting method while 19 states – including Idaho and Oregon – allow alkaline hydrolysis, which involves reducing a body with water and alkaline chemicals. Advocates say both processes use less energy and produce significantly less carbon dioxide than traditional burial and cremation practices. Washington had the highest rate of cremations in the country in 2017, at 77 percent, according to the Cremation Association of North America. Sen. Mike Padden, R-Spokane Valley, suggested the bill be changed to require a Department of Health study on the effect of alkaline hydrolysis on water systems. But extensive studies about the effect of the same chemicals used and produced by alkaline hydrolysis have been done, Pedersen said. “I don’t think we need to reinvent the wheel for technology that, though relatively fresh to us, has been around since the 19th century,” he said. However, one amendment was successful – changing the name of the composting process to “natural organic reduction” from “recomposition,” at the request of funeral directors who had raised concerns. The bill passed 36-11 and was sent to the House, where a similar bill is pending. The bill also would legalize alkaline hydrolysis, often referred to as flameless cremation. Water, heat, chemicals and pressure dissolve a body in a process that produces a result similar to traditional cremation. Italready can be chosen for pets in Washington. A companion bill passed the House Consumer Protection and Business Committee on Wednesday. The bill includes the Senate’s confirmed changes to call the process natural organic reduction. Published: Feb. 6, 2019, 9:11 p.m. Updated: Feb. 6, 2019, 9:42 p.m.